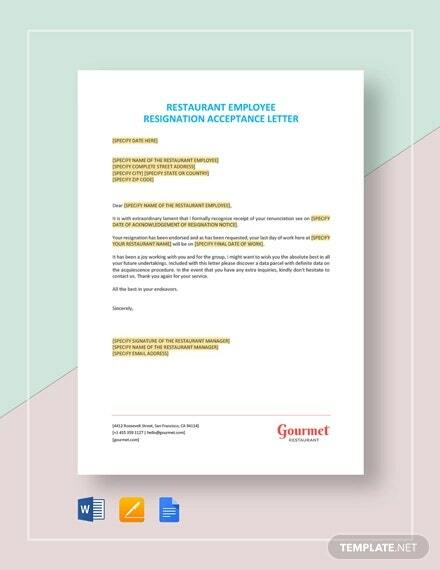 The acceptance letter is a formal document which you would send after you have received a job offer letter from a company. 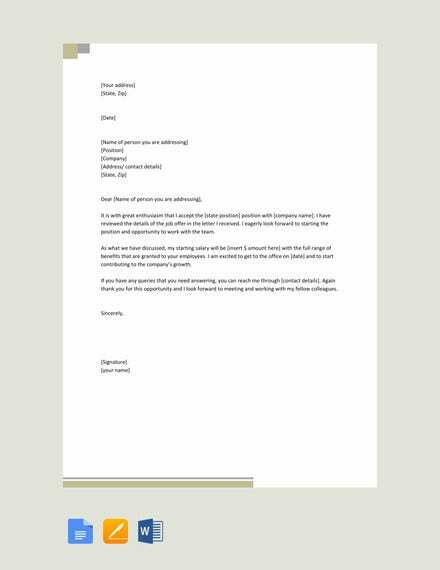 The letter thanks the company for selecting you and also confirms the major aspects of the job that were discussed during the interview. You may also see Letter Samples. 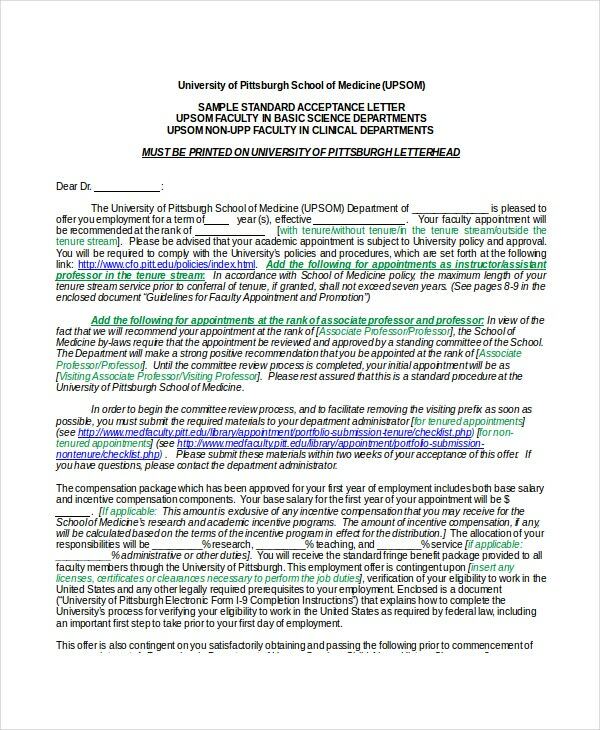 Another set of acceptance letter is the one where the organization accepting your admission sends a letter to you declaring that you have been admitted. 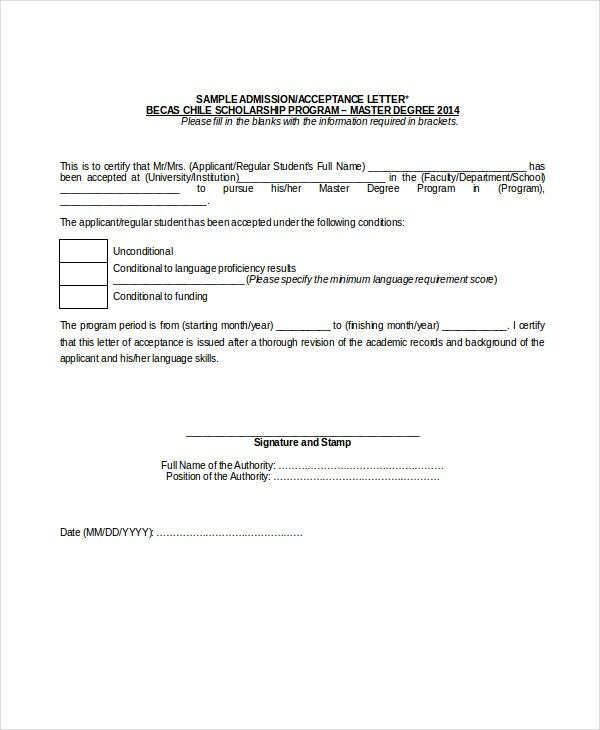 For help, you can consult the readymade acceptance letter templates online. You have a short and simple job acceptance letter here that discusses the entire thing in just 2 paragraphs. The first one talks about the job position and other related details while the second expresses candidate’s enthusiasm to join the company. 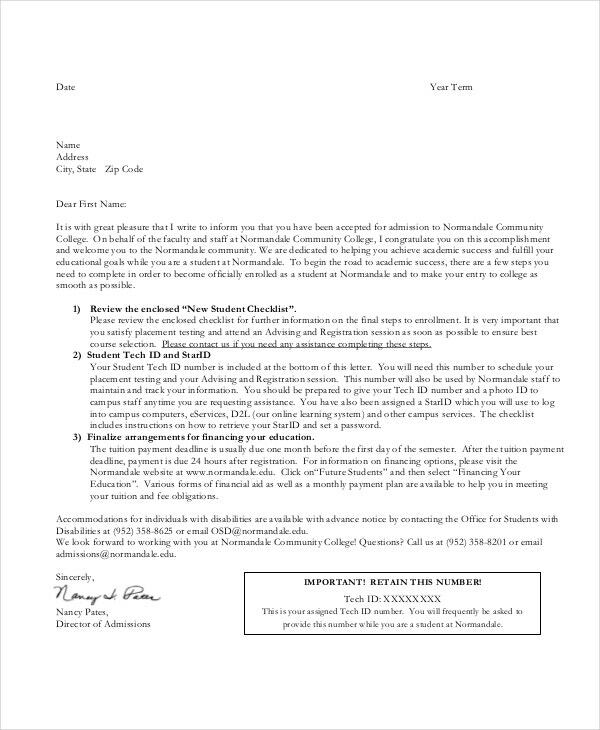 This college acceptance letter is addressed to a student who has been selected for a college course and the letter mentions all the needed details the student must know here- like new student checklist, financing arrangements, etc. 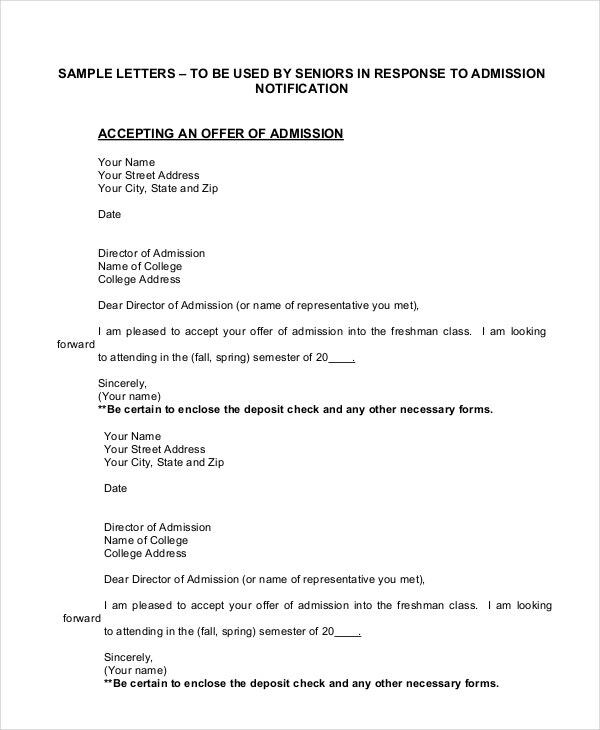 You have two letter samples here- one shows how to accept a college admission offer when you have been selected for the class and the other shows how to politely forward your regret when you cannot accept the offer. 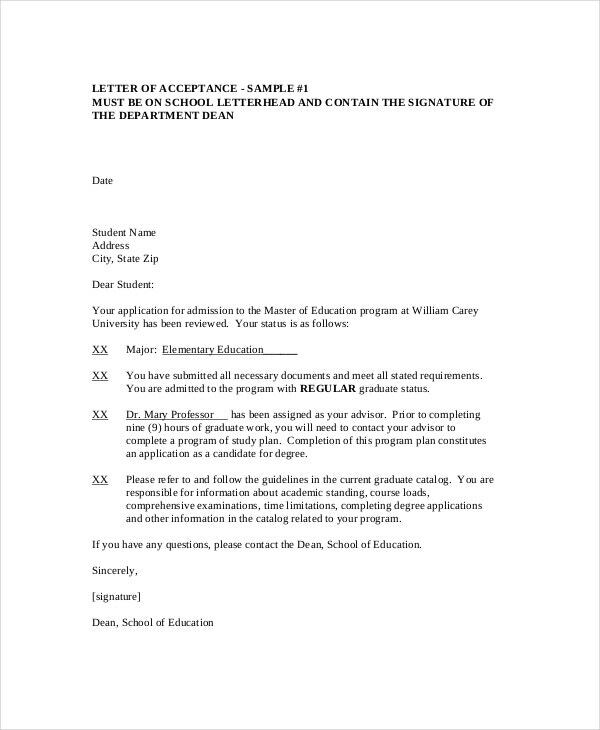 You have a professional approval letter template here which certifies that the student has been selected for a university/institution program. It also states the program period and the conditions under which the student has been accepted. 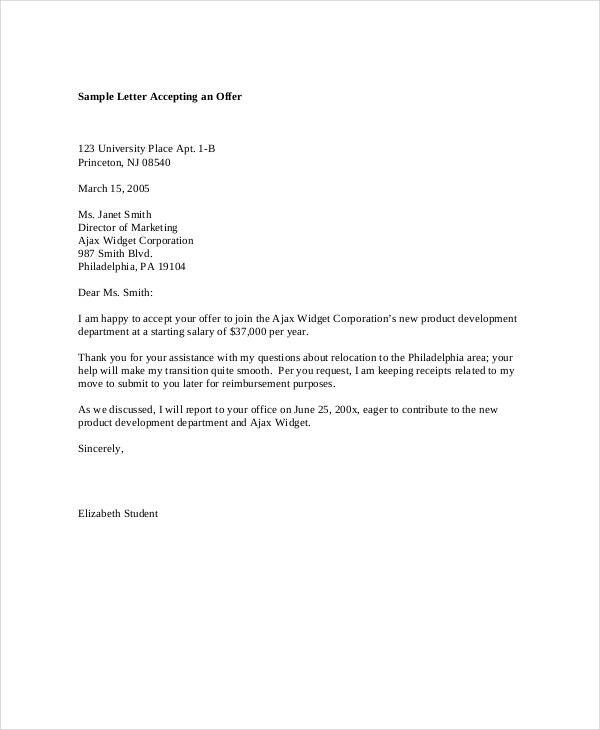 > What are the Main Constituents of an Acceptance Letter? 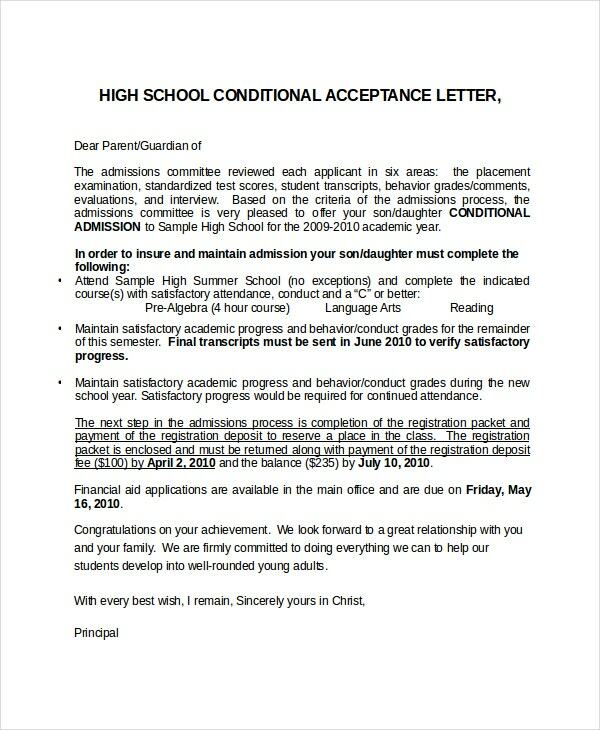 An acceptance letter is composed of 3 main parts. The first one is gratitude. 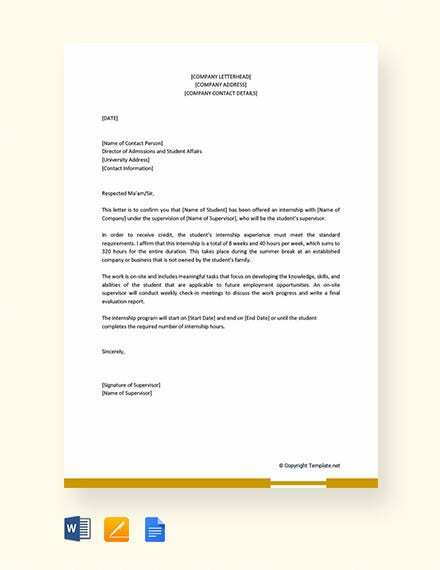 When you have been approved for a college course or job position, you should make sure to forward your gratitude to the organization through the acceptance letter templates. In fact, the letter would start on a note a gratitude. The next part is confirmation where you will confirm the basic details of your job like job position, salary, working hours and so on. 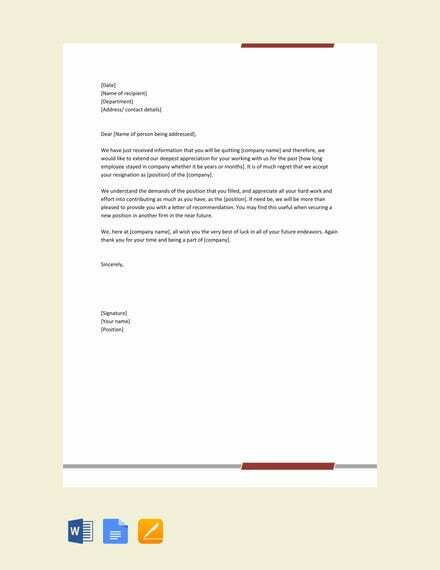 The final part is closing and you must conclude the letter on a positive note. Mention how enthusiastic you are to join the company and that you are looking forward to coming up with your best efforts. 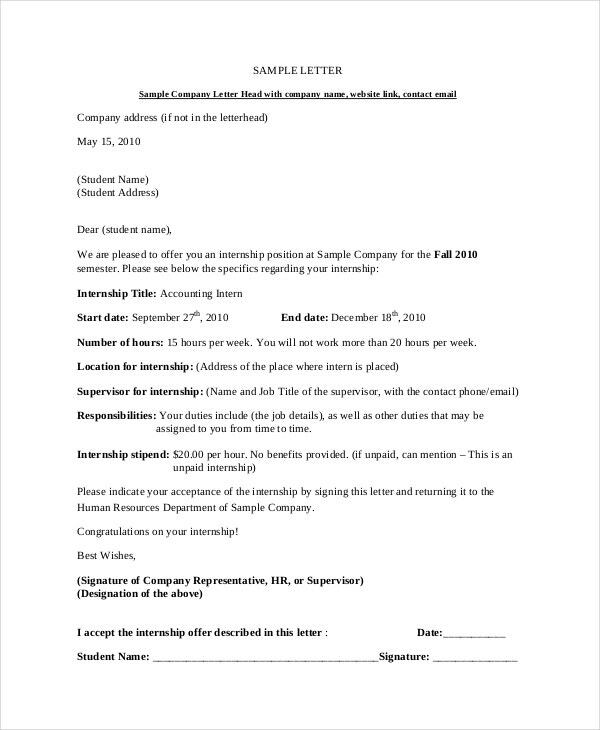 This internship acceptance letter is addressed to the student who has been accepted for the internship position and it lists the major aspects of the internship like the number of hours, stipend, etc. > What is the Benefit of an Acceptance Letter? 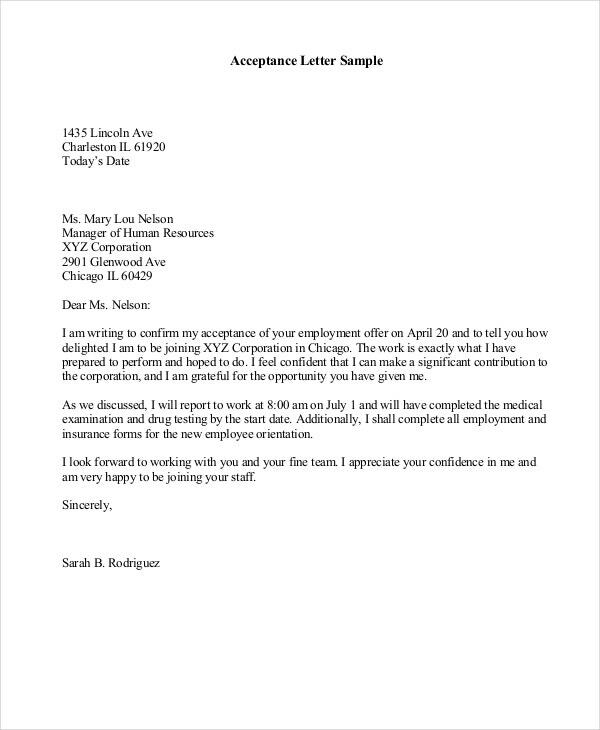 The primary benefit of an acceptance letter is that it forwards a courteous note to your hiring manager thanking him for approving you for the job. 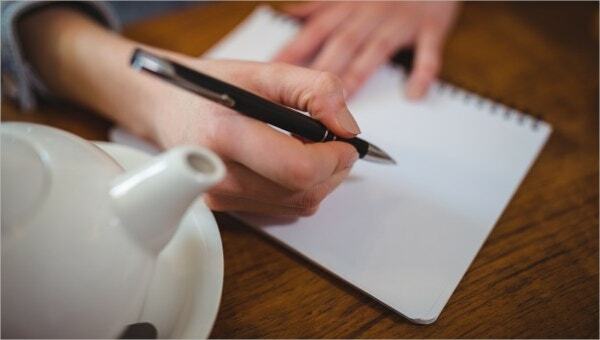 Though it’s not mandatory to send an acceptance letter after you have received the job offer, but then such a letter on your part assures a professional touch and creates a better impression about you. Then, the acceptance letter is also handy to confirm your job position and the salary as well as the benefits you are supposed to receive on joining the office. It’s like double checking what was discussed in the interview or job offer before you finally join the new office. 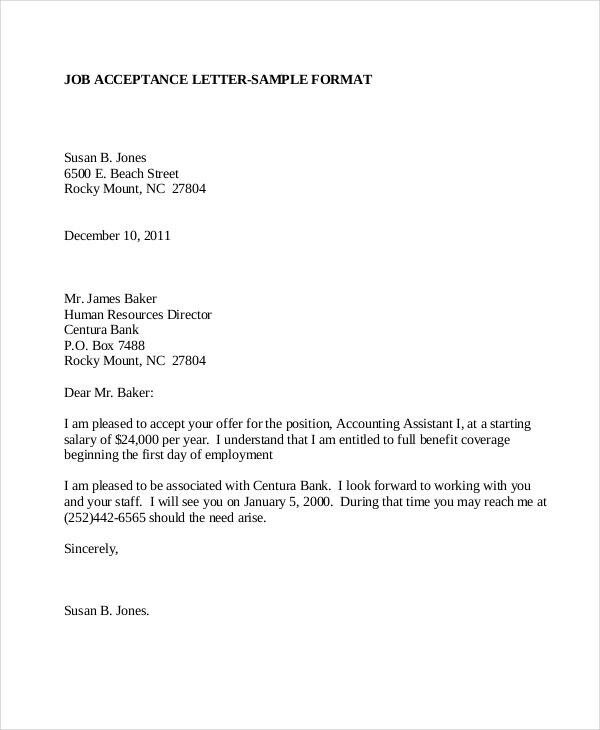 These letters are also used by an organization or authority to approve the request sent by an individual. 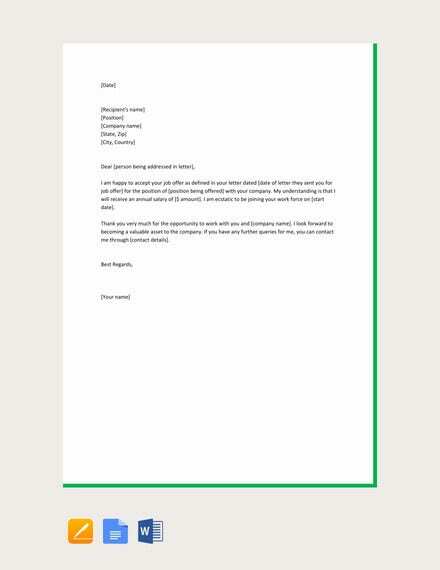 You can also see Acknowledgement Letter Templates. 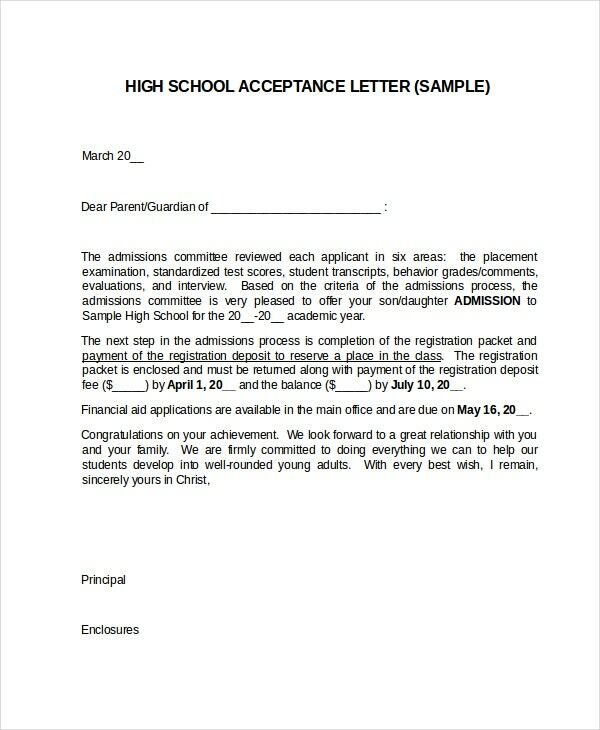 If you are looking for help in framing an acceptance letter, the pre-designed templates mentioned above would be cool for you. 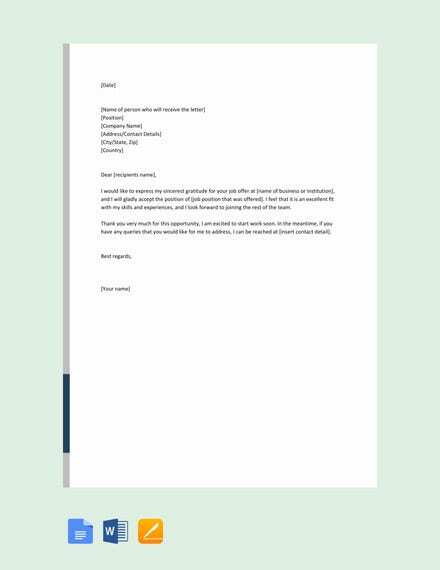 Whether you are a candidate who has just got a job offer letter or the head of an organization who has to inform a student about his selection in your institution- the various templates here will cater to all.